Two arrested during eviction at Levinsky Street, which went by relatively peacefully. Inspectors from the Tel Aviv municipality raided the Rothschild Avenue tent city Monday morning, and began to remove tents and other belongings that had not already been removed by social-justice protesters. As was the case at the Levinsky Street and Ben-Gurion Avenue tent cities, large trailer trucks were sent to take away the property. The Rothschild encampment was the most famous of the tent cities and is also where the summer-long protest began. The protest was spurred on by sympathetic press from the get-go and involved left-wing organization and funding. 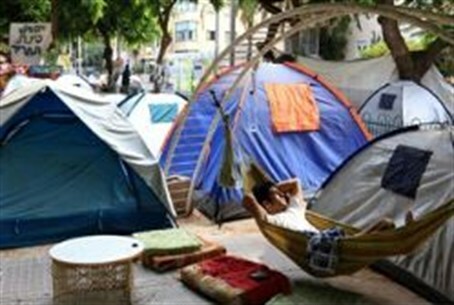 Police forces raided the tent city at Levinsky Sunday night, tore it down and evicted its residents. Some of the protesters tried to resist the police and two were arrested. Protesters had been expecting a police action against them. Overall, however, the operation was carried out smoothly and resistance was much lighter than police had feared. Residents promised to rebuild the tent city after police leave, because, they say, they have nowhere else to go. "It's true that we decided not to be violent and not to react to the eviction with force, but we have nowhere to go. We will have to go back here," a protester said. The eviction of the remaining tent city in Rothschild Avenue was postponed by a court order that restrained police from tearing it down until 10:00 a.m. Monday. Police prepared for the Rothschild eviction anyway, closing off approaches to the tent city in order to prevent protester reinforcements from arriving at the scene. When the hour arrived without a court decision extending the restraining order, they set to work.